I have been wondering about the identification of these three Indian delegates for quite a while. The photo is from SIRIS. I would guess that it could be made in the 1870s (1875?) in Washington. Most probably the Indians are Sioux. I am aware of only one other Lakota image in which an identical fan appears. Also in the Taylor Collection on SIRIS is a photograph of the Oglala Lakota headman Slow Bull Tatanka Hunkesni (c1823-1904). The only delegation that I am aware that Slow Bull participated in was for 1872, suggesting that the unidentified image was also taken that year. As to the identification of the image, I sent it to a few friends. 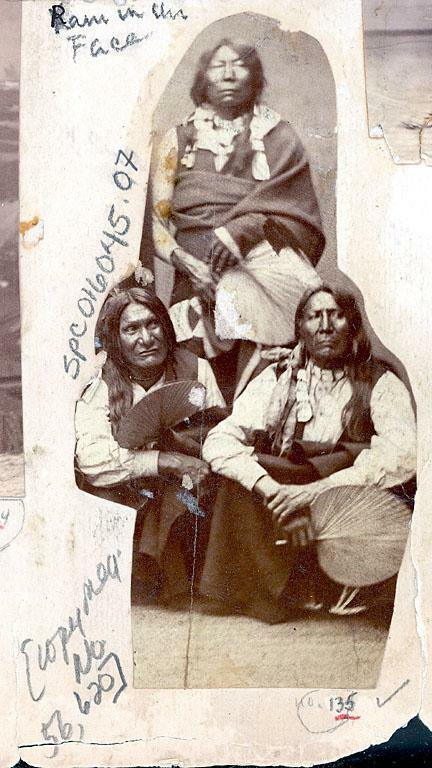 One suggested that the man in the immediate left is Charger, prominent Sans Arc headman from Cheyenne River Agency. I do not have any photographs of him with which to compare. He also suggested that the man on the right is the Brule Gassy. After looking at Gardner's 1872 portraits of Gassy, I am not certain. The fan in the Slow Bull photo seems identical.